The Ethiopian Federal High Court has ordered the property of a jailed Ethiopian journalist and opposition party leader to be confiscated. The decision to confiscate Eskinder Nega's property, according to the Ethiopian Ministry of Justice, comes after a request made by federal prosecutors. However, the courts ordered that a villa house registered under Nega's name and another residential house, inherited from his parents, as well as an automobile registered under his wife's name, not to be sold or transferred to a third party. Nega is currently serving 18 years imprisonment on terrorism charges. In May 2012, Eskinder was awarded the prestigious Pen American's Freedom to write annual prize for his work. The courts also ordered that opposition leader, Andulem Arage's car, which was believed to be his, but registered under his wife's name, not be sold or transferred to a third body. Arage is serving life imprisonment under the same terrorism charges. The federal court also ordered the property of another journalist, Abebe Gelaw's property, a stand and a residential villa in Addis Ababa not to be sold or transferred to a third body. Gelaw, a United States resident, was sentenced to 15 years imprisonment in absentia. His residential house is said to be registered under his wife's name. 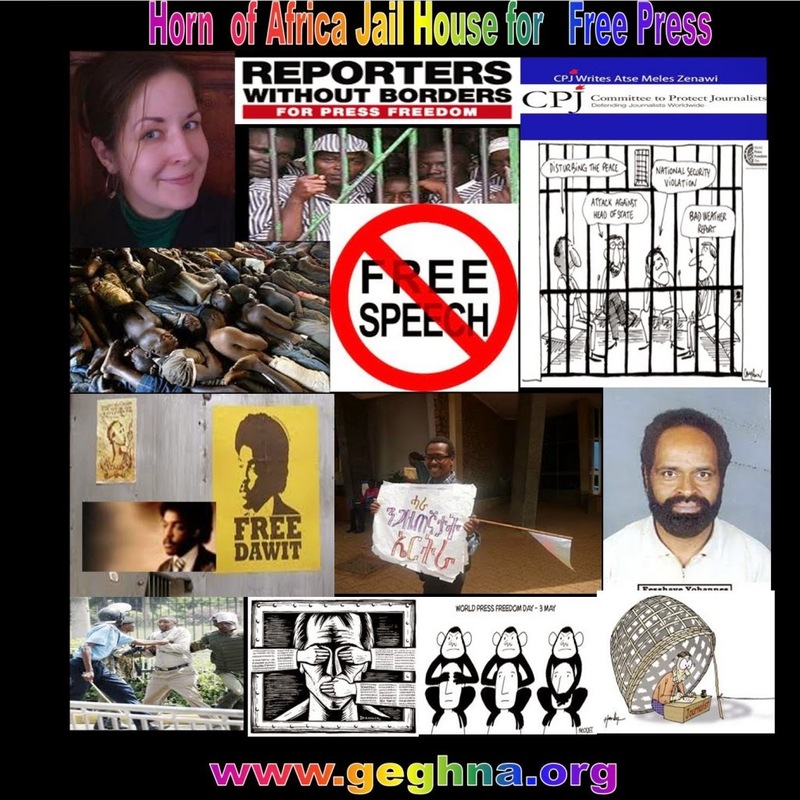 In July 2012, Ethiopian courts sentenced 20 journalists and opposition politicians between eight years to life imprisonment. ADDIS ABABA: Sweden’s national television channel SVT has reported that their website has been blocked by the Ethiopia government since early Saturday morning. The reported blocking, which Bikyamasr.com was able to confirm was not loading in the country, comes less than two weeks after two Swedish journalists Johan Persson and Martin Schibbye were given pardons after serving one-year in jail on “terrorism” charges after being arrested while covering stories in the eastern part of the country. But another reporter said Ethiopia is weary of Sweden’s coverage of the country and is taking precautions. It is still unclear if the site is being blocked by the government, or there is a problem with the service providers in Ethiopia, although experts say the blocking is more likely a cause. "Ethiopia is very uncomfortable with the information that we have broadcast. They know that we are going to produce more," said reporter Johan Ripås to svt.se. "It is very regrettable if it is that they have shut down our site, that a country imposes such restrictions. We have had a comprehensive coverage and have strong sources, and they are obviously irritated by the publicity," he told the TT news agency. "If they have done so deliberately then it is a very serious and powerful signal." "We are going to contact Ethiopia's embassy in Sweden to seek an explanation for why they have done this." "There are others also reporting so if there should be any point with it then they should close more Swedish sites," he said. (Scanpix Sweden, Anders Wiklund/ Associated Press ) - Swedish reporter Martin Schibbye, front left, stands with Swedsih Photographer Johan Persson are welcomed by various friends and family as they arrive at Arlanda airport in Stockholm, Sweden, Friday Sept. 14, 2012. 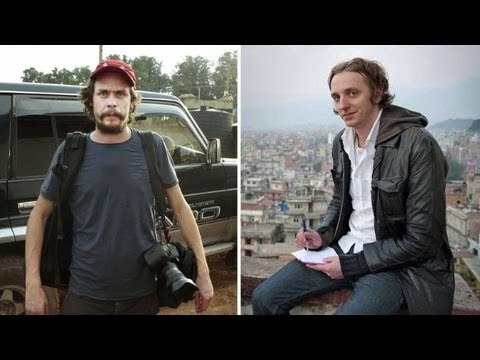 The two Swedish journalists were released from captivity earlier this week in Ethiopia after being pardoned by the government which had sentenced them in July 2011 to 11-years for abetting terrorism and entering the country illegally. STOCKHOLM — Back home after being imprisoned in Ethiopia for more than a year, two Swedish journalists on Friday dismissed their trial on terror charges as a “sham,” saying they accepted 11-year prison terms to improve their chances of being released. Martin Schibbye and Johan Persson also said in a news conference that their apology on Ethiopian TV in connection with their release last week was not sincere. The two were arrested in the summer of 2011 while trying to cross from Somalia into Ethiopia’s Ogaden region along with fighters from the separatist Ogaden National Liberation Front, which Ethiopia classifies as a terrorist group. In December, the journalists were sentenced to 11 years each for abetting terrorism and entering the country illegally. They denied the terror charges, saying they were in Ethiopia simply to do their work as journalists. The Swedes said that a video used as evidence against them supposedly showing the raid in which they were arrested was actually recorded several days later and was staged by the Ethiopian army. Schibbye also said that in the days following the arrest an interrogation leader threatened to kill him in the desert. “They have been saying all along that they were being treated very well, they were even comparing the situation with other countries to say they were very ok and are better off here,” Mufti told The Associated Press. Associated Press writer Kirubel Tadesse in Addis Ababa, Ethiopia, contributed to this report. Ethiopian officials deny the claim that they faked footage in order to get the two jailed Swedish reporters Martin Schibbye and Johan Perssonconvicted of terror charges, in interview with national Swedish broadcaster Sveriges Radio (SR). “Why would we try to trick ourselves with a faked video? Our soldiers took them in and made sure that they were given a fair trial,” said Mulugeleta Ayalew, of the Ethiopian ministry of justice’s pardoning committee to SR. Neither did Ayalew believe that the trial was meant to serve as a warning to other foreign journalists thinking about reporting from Ogaden. “The Ethiopian government has no reason to stop you from going there, as long as you have all permits in order. Ethiopia is an open country where everyone can move freely,” he told SR.
Ayalew told SR that their pardoning should be seen as a sign of goodwill between Sweden and Ethiopia, and may even serve to strengthen ties between the two countries. Schibbye and Persson were arrested last year with rebels from the Ogaden National Liberation Front (ONLF) after illegally entering Ethiopia from Somalia. The Swedes were in the remote southeastern region of Ogaden, populated mainly by ethnic Somalis, reportedly to investigate the activities of a company affiliated with the Swedish oil firm Lundin Petroleum. The two Swedes were released from Ethiopian jail on Monday and after recuperating in another country for a few days will touch down on Swedish soil and be reunited with loved ones on Friday. Nairobi — The Committee to Protect Journalists today called on the Ethiopian government to set free six journalists in prison for their work, a day after Swedish journalists Johan Persson and Martin Schibbye were pardoned and released from Kality Prison in the capital Addis Ababa. Ethiopian News in Amharic - Tuesday, September 11, 2012 - YouTube: " "
Ethiopia - Interview with two Swede Journalists pardoned by Ethiopian government - YouTube: " "
Two Swedish journalists who have been imprisoned in Ethiopia for more than a year have been liberaed and are set to be freed, Ethiopia's justice minister announced Monday. Minister Berhan Hailu told reporters in the Ethiopian capital, Addis Ababa, that the decision to liberate photographer Johan Persson and reporter Martin Schibbye had been approved by the late Ethiopian Prime Minister Meles Zenawi. The Swedish journalists are among 1,923 convicts in prisons around the country who are getting amnesty, he said, adding that only those who show remorse can be pardoned. The Ethiopian government has over the years released hundreds of prisoners in a ceremony timed to coincide with the start of the new year according to Ethiopia's calendar. "The two Swedes are among the ones to be released," Berhan said. "The decision to pardon them was made in July." The minister could not say precisely when the journalists would be released from jail, saying only that this might happen within the next 24 hours. Persson and Schibbye have been in jail since July 2011, when they were arrested while trying to cross from Somalia into Ethiopia's Ogaden region along with fighters from the separatist Ogaden National Liberation Front, which Ethiopia classifies as a terrorist group. Last December the journalists were sentenced to 11 years for abetting terrorism and entering the country illegally. They denied the terror charges, saying they were in Ethiopia simply to do their work as journalists. Their jailing was condemned by rights watchdogs such as the Committee to Protect Journalists, which said their trial was "an affront to justice and press freedom." After several weeks of investigating reports from sources in Eritrea and from prison guards who fled the country, Reporters Without Borders has been able to confirm that three more journalists - Dawit Habtemichael, Mattewos Habteab and Wedi Itay - have died in the northeastern prison camp of Eiraeiro. All three had been held since late 2001. Another journalist arrested in February 2009, whose identity has not been established with certainty, has also reportedly died in detention - in his case, in Abi Abeito military prison near the capital, Asmara. The only good news is that Tesfalidet "Topo" Mebrahtu, a well-known sports journalist who worked for state-owned radio Dimtsi Hafash and state-owned Eri-TV, was "released on bond" (he is still under surveillance, with relatives acting as guarantors) in early 2012 after being held for 10 months. "While all eyes are turned on Syria, another, less visible, tragedy is being played out in Eritrea, a country forgotten by the international community although it is the world's leading media freedom violator and Africa's biggest prison for journalists," Reporters Without Borders said.